Old time stringband that makes you want to dance. All instrumental clawhammer banjo, fiddle, guitar and bass. Acoustic stringband music in the southern appalachian style, this album is all instrumental music that is great for clogging or just drivin faster! 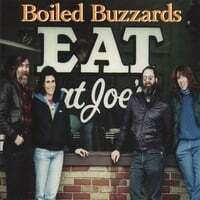 Eat At Joe’s - Dan Levenson with The Boiled Buzzards. Introducing fiddle with our third release. Tunes: Paddy on the Turnpike; John Brown’s March/Waiting for the Federals; Snake River Reel; Hollow Poplar; Spotted Pony; Dinah/Wake Up Susan; Black Widow Romp; Katy Hill; Nixon’s Farewell; Shady Grove; Spring in the Valley; Cuffy; The Year of Jubilo/Yellow Rose of Texas; Jimmy in the Swamp; Nixon’s Farewell (w/double fiddles); Julianne Johnson; Tombigbee Waltz. Instrumentation: All instrumental music played with Dan Levenson on banjo and fiddle, Christian Wig - fiddle, Annie Trimble - guitar, and Ruth Kass on acoustic bass.